Colorado Springs, at an elevation of 6,035 ft., is a city in Colorado at the eastern foot of the Rocky Mountains. It lies near glacier-carved Pikes Peak, a landmark in Pike National Forest with hiking trails and a cog railway leading to its 14,114-ft. summit. The city’s Garden of the Gods park features iconic red-sandstone formations and mountain views. 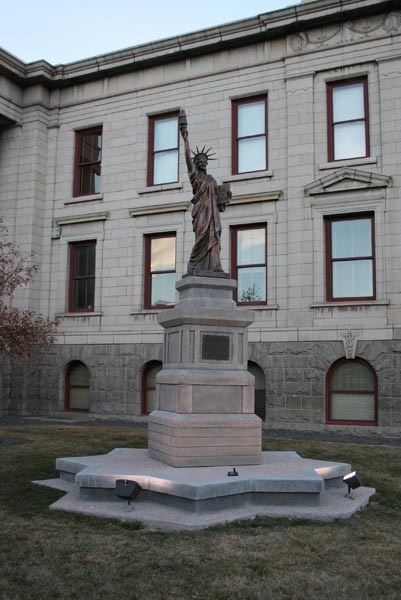 Colorado Springs Statue of Liberty replica stood in front of the Old City Hall at Nevada Avenue and Kiowa Street. In 1998 the statue was removed for a refurbishment. The statue was taken to an auto body shop and the natural patina was coated by dark brown paint. After that ill fated makeover the statue looking like a large piece of melting chocolate, it was installed in front of the Police Operations Center at Rio Grande and Nevada. In 2007, Crawford Conservation in Ft. Collins was selected to performat a complete restoration. The bathroom style light that someone installed has been removed and the original looking torch was made and re-installed. When restoration is complete the statue will be returned to the City Hall where she will greet citizens as they come and go from the building. A great article to read is in the July-September 2007 MUSELETER, a publication of the Colorado Springs Pioneers Museum Volume 18, Number 3. She indeed stands on the south west corner of the City Hall grounds today. She resides within a star base with a very ornate concrete pedestal of at least seven feet. We are interested in learning about her journey to this resting place, her restoration efforts and any/all other information related to her. If you can provide stories and/or images please use our online form to submit your information. We appreciate all the assistance we can get in keeping this site the most complete, accurate and up to date Liberty Sister’s site on the internet!